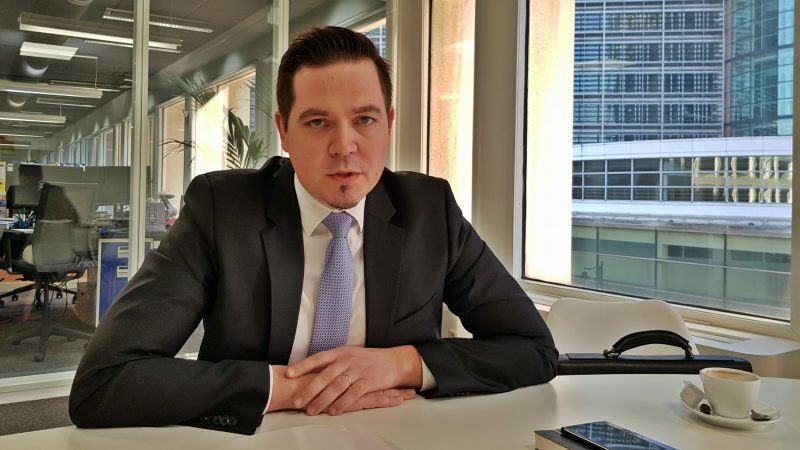 EXCLUSIVE / In a wide-ranging interview, the minister of foreign affairs and European integration of Moldova, Tudor Ulianovschi, talks about his country’s relations with the EU and Moscow, the political situation ahead of crucial elections, and the prospects for frozen conflicts in Transnistria as well as other issues. Tudor Ulianovschi is the minister for foreign affairs and European integration of the Republic of Moldova. He is a career diplomat and has served in Washington and Qatar. What brings you to Brussels? Yesterday was a very important day for Moldova’s EU path. We had a good meeting, in the morning, of the so–called group of friends of Moldova, followed by the Foreign Affairs Council. One of the agenda items of the Foreign affairs council was the Republic of Moldova and yesterday in the evening we had a good evening with Federica Mogherini where we also debated and discussed the future of Moldova – EU relations. Your country will hold elections this year, but is the date set? At this point, we are looking towards the end of November or perhaps the beginning of December. The precise date would be decided in the near future by the parliament of the Republic of Moldova. In the Council conclusions of yesterday’s ministerial meeting, I notice regret that the new electoral law does not address key recommendations of the Venice Commission and so on. How would you comment? In our opinion, the majority of the recommendations of the Venice Commission were taken into consideration. At the same time, the Moldovan parliament following the internal consultation with various stakeholders also from the civil society has decided to adopt the new electoral code that includes the new system of elections, a mixed system, based on the party lists and on the uninominal circumscriptions. But this translates into an advantage for the two largest parties and disadvantages for the smaller parties. That is one way, perhaps of looking at that. On the other hand, in my opinion, it is good that the regions or the “raions” of the Republic of Moldova will have the opportunity to delegate and to elect their own representatives from the “raions” to be elected in a position of a member of the Parliament. In this case, there will be a direct responsibility of that elected official towards a certain region of the Republic of Moldova so hopefully – and this is my understanding – that the responsibility and accountability of particular MPs but also the Parliament in general, will increase. Moldova gives the impression of a divided country also because the president is pro –Russian, the government is pro-European and pro-western, you yourself are pro-European and pro-western. Do you think that at some point Moldova will have a less ambiguous and clearer pro-European positioning? I will tell you like this. Number one, I am a clear pro–European, pro-Westerner. Number two, I think the Republic of Moldova has reached the point of no return in its European integration path. From this perspective, I think that what is most important for us is to ensure the implementation of the Association Agreement between the Republic of Moldova and the European Union, which at this point, would allow the Republic of Moldova to have better institutions, better economic development, and therefore from the perspective of which model of development, or which model of the future development of the Republic of Moldova is more beneficial for its citizens. And now I speak also as a citizen of the Republic of Moldova. When I go to the European Union, when I visit EU member states, I see a model of structuring the government, the model of the development of the democratic institutions, I think that this model is the one that should be applied for the Republic of Moldova, for its future. And this is important, also to understand that the European model of development is not only beneficial to the government, but for the citizens of the Republic of Moldova. And this is where, I think is important, to better communicate to the citizens of the Republic of Moldova, being in a very dynamic geopolitical context, geopolitical environment. We have been a part of the Soviet Union, we have been independent for 26 years, that is why it is important for the government to help the Moldovan citizens make their own decisions. But they have to have access to the European format of development, the European format of democracy, and to have access of information, and this is where the task of the government is to better inform the Moldovan citizens of the advantages provided by the EU integration. And also, if we look at the opinion polls, the majority today in Moldova are showing a preference towards the EU that has to be sustained by the efforts of the Moldovan government to better implement the reforms, to restructure the justice sector reform, to fight corruption, and this would also, in my opinion, will further increase. I read the speech of your prime minister at the Munich security conference. He made the point that the same division I was telling you about Moldova exists in many of the eastern European countries. Of course, many of them are already EU members but the same problems exist. Being from Eastern Europe myself, I think he has a point: Probably Moldova would like to have the same chances like those countries, despite those divisions, which are the result of historical circumstances. What is your take? I think that looking at the Republic of Moldova from the perspective of the division of the spheres of influence is a wrong approach, it is not a constructive approach. The best approach is to speak from the perspective of the Republic of Moldova and its sovereignty. The sovereignty of the Republic of Moldova or any country whatsoever relies on the fact that a country decides for itself where it wants to be. I was also at the Munich security conference, accompanying the prime minister Pavel Filip, who has stated very clearly, that the Republic of Moldova has good relations with the West and also good relations with the East, and with the Russian Federation. But, in our opinion, the main foreign policy priority is European integration of the Republic of Moldova and it doesn’t contradict the current format of participation of the Republic of Moldova in the CIS (Commonwealth of Independent States) region as well. So from this perspective, I think it’s very important to understand that we should not speak of a zero-sum game, we should speak of a win-win perspective, having in mind that the political choice of the Moldovan people is European Integration, but the economic choice should be focused both onto the East, and onto the West. When I speak to Russian diplomats, they say that, unlike others, Moldova has not adopted sanctions against Russia in the same way as countries in the EU orbit have. Are you under pressure from Mogherini or from other representatives of the European Union to introduce sanctions? No, we cannot speak of any pressure from the European partners and from Madame Mogherini at all, to impose any sanctions in relation to the Russian Federation. On the contrary, unfortunately, the Russian Federation was imposing certain trade barriers to imports of Moldovan products. In our opinion, the fact that we are facing the vast majority of Moldovan products not being allowed to enter the Russian Federation markets, especially the Moldovan wine and other agricultural products, is a violation of the bilateral agreement between the Republic of Moldova and the Russian Federation on the free trade. Also, in our opinion it violates the Republic of Moldova and CIS free trade agreement, and on top of that, in our opinion, being both the Republic of Moldova and the Russian Federation members of the WTO, we do not think that these actions from the Russian Federation by imposing limitations or barriers to import from the Republic of Moldova are in line with the Russian Federation’s commitments to the WTO. So, I would say on the contrary, the Republic of Moldova would like to have normal economic relations with the Russian Federation but we are yet to see a more open policy from Moscow. Is this the main problem? I mean, when I look at the type of relations Moldova has with the EU, what triggers this Russian attitude? The Association agreement, the DCFTA? Well, I can give you some numbers now. At this point today, and I think, thanks to the EU-Moldovan association agreement and the deep and comprehensive free trade agreement (DCFTA), today the EU is Moldova’s main export and trading partner. We have 65% of Moldovan goods being exported to the European Union market, and Romania is now Moldova’s largest trading partner. So from this perspective, I think that the Republic of Moldova has even greater potential to increase their exports to the EU market but also we would like to have normal trade relations with the Russian Federation. But unfortunately, these limitations from the Russian Federation occurred soon after or perhaps of a misunderstanding of the fact that the DCFTA does not contradict the Republic of Moldova’s relationship, economic relationship, with the Russian Federation. And in our opinion, this DCFTA not only should, but is complementary to Moldova’s FTA with the CIS countries, and with the Russian Federation. The Ministers yesterday adopted a text which is calling on your country to be more decisive in the fight against corruption. I am thinking about this extraordinary case where one billion euros or dollars disappeared from a bank. I know that a very expensive western company was hired to investigate, but I haven’t heard of any results. Can you update us? Indeed, the finalisation of the investigation of the banking fraud that occurred in the Republic of Moldova is a priority for the government and for the law enforcement agencies. At the same time, the Kroll company has been hired to assist us in investigating the banking fraud. The summary of their second Kroll report has been made public. In the month of March, we will have a visit to the Republic of Moldova from the experts from the Kroll company and we will have a discussion with this company in order to have the full picture and to have the details from the investigation. So the Republic of Moldova together with international partners, but also with certain EU member states can have a relationship that will help us to have the full picture on the one hand, and to finalise the process of the recovery of the assets lost. With regards to the fight against corruption, I would like to inform you of a positive development in the sense that a new national integrity authority was set up in the Republic of Moldova. It now has a director and a deputy director. It is now in the process of recruiting the so-called integrity experts, or inspectors, 40+ people, and we envision that by the end of March, perhaps beginning of April, the recruitment process will finalise so that in April the integrity inspectors being charged with examination of the declarations of assets of judges, of the appointed and elected officials, will start their work and we envision that by July the national integrity authority will become fully operational. When I interviewed your prime minister Pavel Filip a few months ago, he was quite optimistic about the Transnistria conflict. Can you update us on this? 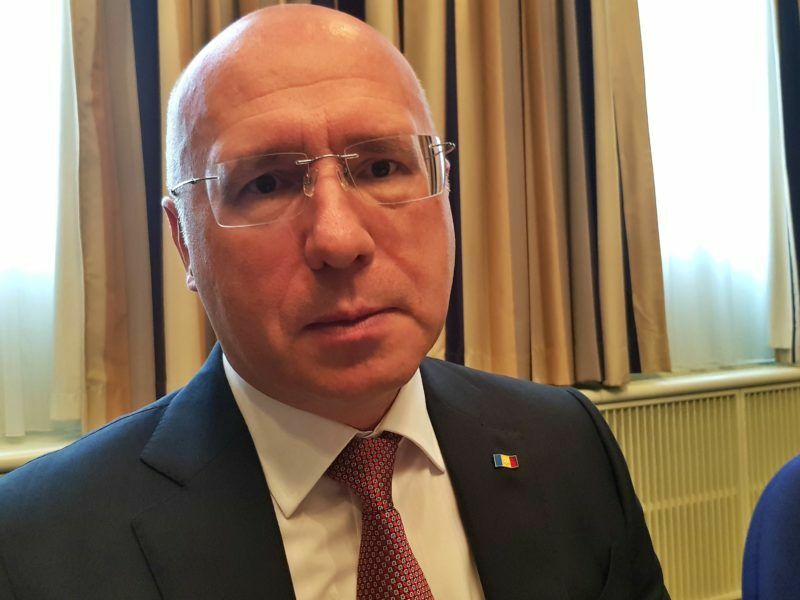 The Prime Minister of Moldova Pavel Filip told EURACTIV.com in an exclusive interview that there are good prospects for finding a solution to the Transnistria conflict, one of the post-Soviet frozen conflicts which have caused enormous harm to the region’s populations. Indeed, the end of 2017 was an optimistic one, mainly because in the context of the Austrian [OSCE] chairmanship there were reached 5 decisions, 5 protocols, with relationship to the confidence-building measures promoted between Chisinau and Tiraspol. This year in 2018 we have already had two good progresses in relation to the Latin-based script schools in the Transnistria region in the Republic of Moldova, the activity of the Gura Bicului bridge, which now needs to have a better infrastructure. There are ongoing discussions with relationship to setting up telecommunications, but also with relationship to car license plates for vehicles from the Transnistrian region of the Republic of Moldova. There is a political will in Chisinau to move forward with these discussions, with these confidence-building measures. There is a, in my opinion, a good dialogue with the representatives from Tiraspol. At this point, perhaps it would be good if our European partners and the EU itself would further encourage the authorities of Tiraspol to be more flexible and pragmatic, in the sense of finalising these discussions on the two topics that I have mentioned, so that we can have these decisions adopted in the near future. Because, let’s speak very openly, they would be to the benefit of the citizens of the Republic of Moldova, be it in the Transnistrian region of the Republic of Moldova, and all the others. Because we need to have a better people-to-people contact, we need to ensure the direct contact between all sides and this will create the necessary prerequisite to the confidence-building measures on the one side, and will also slowly bring us slowly closer to a potential future political settlement of the conflict. So I wouldn’t say that I am optimistic, I am encouraged by the positive developments in the 5+2 talks [involving Russia, Ukraine, the OSCE, Moldova, Transnistria, as well as the US and the EU], at the end of last year, and now it’s very important to make the current negotiation process on the confidence-building measures sustainable and orientated towards results.